Throughout its website, the Diocese of Little Rock provides links to other websites solely for the user’s convenience. By providing these links, the Diocese of Little Rock assumes no responsibility for, nor does it necessarily endorse, these websites, their content or their sponsoring organizations. The Diocese of Little Rock respects visitor privacy and is committed to protecting it. Visitors can visit most pages on the Diocese of Little Rock website without identifying themselves or providing any personal information. However, if a visitor wishes to contact the Diocese of Little Rock or post information to the site, the user will be asked to provide contact information and an e-mail address. When submitted, this information is immediately transmitted to the Diocese of Little Rock and is not stored on our web server. The Diocese of Little Rock does not log or store personally identifiable information such as name or e-mail address on its web server. The Diocese of Little Rock has implemented procedures to safeguard visitor Personal Information. The Diocese of Little Rock restricts access to Personal Information to those Diocese of Little Rock employees and agents who need to know that information in order to provide our products or services to them. The Diocese of Little Rock maintains physical, electronic and procedural safeguards that meet or exceed federal standards to safeguard Personal Information. NOTICE. The Diocese of Little Rock site (the “website”) is made up of various web pages and is offered to you conditioned on your acceptance without modification of the terms, conditions and notices contained herein (the “Terms and Conditions”). Your use of the website constitutes your agreement to all such Terms and Conditions. PERSONAL AND NON-COMMERCIAL USE LIMITATION. Unless otherwise specified, the website is for your personal and non-commercial use. You may not modify, copy, distribute, display, perform, reproduce, publish, license, create derivative works from, transfer, retransmit, or sell any information, software, products or services obtained from the website. You may not use any computerized or automatic mechanism to access, extract and/or download any information from the website. LINKS TO THIRD PARTY SITES. The website may contain links to the websites controlled or offered by third parties. The Diocese of Little Rock disclaims liability for any information, materials, products or services posted or offered at any of the third party sites linked from the website. By creating a link to a third party website, the Diocese of Little Rock does not endorse or recommend any products or services offered or information contained at such linked website, nor is the Diocese of Little Rock liable for any failure of any products or services offered or advertised at such linked website. NO UNLAWFUL OR PROHIBITED USE. As a condition for your use of the website, you agree that you will not use the website for any purpose that is unlawful or prohibited by these Terms and Conditions. The website is not intended for distribution to, or use by, any person or entity in any jurisdiction or country where such distribution or use would be contrary to local law or regulation. You may not use the website in any manner which could damage, disable, overburden or impair the website, the networks connected to the website, or interfere with any other party’s use and enjoyment of the website. You may not attempt to gain unauthorized access to the website, other accounts, computer systems or networks connected to the website by any means, including without limitation, hacking or password mining. You may not obtain or attempt to obtain any materials or information through any means not intentionally made available through the website. MATERIALS PROVIDED. 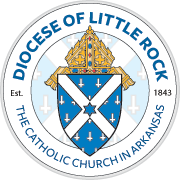 The Diocese of Little Rock does not claim ownership of any materials you provide to the diocese (including comments, feedback and suggestions) or post, upload, input, provide or submit to the website for review by members of the general public, or by members of any public or private group (each a “Submission”). However, by posting, uploading, inputting, providing or submitting your Submission you are granting the Diocese of Little Rock and its agents permission to use your Submission in connection with the Diocese of Little Rock’s operation of the website and its other businesses, including without limitation, the right to copy, distribute, transmit, publicly display, reproduce, edit, translate and reformat your Submission, and to publish your name in connection with your Submission, all without the payment of compensation to you in respect of any such use of your Submission. You warrant and represent that you own, or otherwise control, all of the rights to your Submission, including without limitation, the rights necessary for you to post, upload, input, provide or submit your Submission. NO RIGHT TO REDISTRIBUTE WEBSITE MATERIALS. You agree that you will not redistribute, copy, amend, or commercially exploit any materials found on the website without the Diocese of Little Rock’s express written permission, which permission may be withheld in the Diocese of Little Rock’s sole discretion. LIABILITY DISCLAIMER. THE TOOLS, WEBSITE AND ANY CONTENT OR SOFTWARE CONTAINED THEREIN OR ACCESSIBLE THEREFROM, ARE PROVIDED “AS IS”. EXCEPT TO THE EXTENT REQUIRED BY APPLICABLE LAW, THE DIOCESE OF LITTLE ROCK MAKES NO WARRANTIES OR REPRESENTATIONS OF ANY KIND REGARDING: (A) THE UP-TO-DATENESS, ACCURACY, TIMELINESS OR COMPLETENESS OF ANY INFORMATION CONTAINED WITHIN OR AVAILABLE THROUGH THE USE OF THE TOOLS OR WEBSITE; (B) THE RESULTS OBTAINED FROM THE USE OF THE TOOLS OR WEBSITE; AND (C) ANY INFORMATION PROVIDED BY THIRD PARTIES AND ACCESSIBLE ON OR THROUGH THE USE OF THE TOOLS OR website. EXCEPT TO THE EXTENT REQUIRED BY APPLICABLE LAW, THE DIOCESE OF LITTLE ROCK: (A) DISCLAIMS ANY EXPRESS OR IMPLIED WARRANTIES AND CONDITIONS, INCLUDING WITHOUT LIMITATION, ANY WARRANTIES AS TO NON-INFRINGEMENT, MERCHANTABILITY OR FITNESS FOR A PARTICULAR PURPOSE; AND (B) DOES NOT WARRANT THAT THE TOOLS OR WEBSITE OR ANY CONTENT THEREIN WILL BE UNINTERRUPTED OR ERROR FREE, OR THAT DEFECTS WILL BE CORRECTED. INDEMNITY. You agree to indemnify and hold the Diocese of Little Rock, its parent, subsidiaries, affiliates, directors, officers and employees, harmless from any claim, demand, or damage, including reasonable attorneys’ fees, asserted by any third party or arising out of your use of, or conduct on, the website. COPYRIGHT. The website and Tools are protected by copyright law and international treaty provisions and may not be copied or imitated in whole or in part. No logo, trademark, graphic or image from the website may be copied or retransmitted without the express written permission of the Diocese of Little Rock.